Ready to give your rig a solid-state makeover? Then we have just the competition for you! 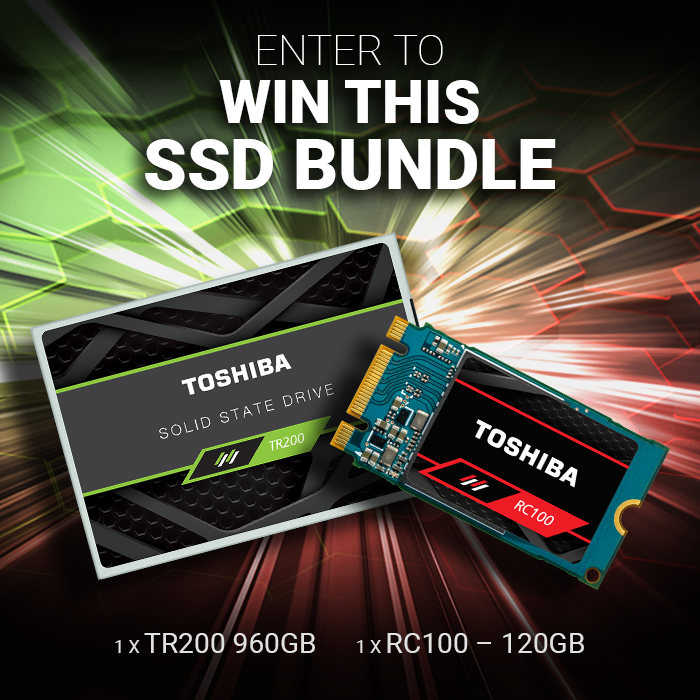 In partnership with Toshiba, we're giving away an SSD bundle containing over a terabyte of super-fast storage! Our lucky winner will bag an ideal NVMe system drive in the form of a 120GB Toshiba RC100 NVMe M.2 SSD, and if you're wondering where you'll keep all your games, don't worry as we're also throwing in a spacious 960GB Toshiba TR200 2.5in drive for good measure! Just what you needed for a 2019 new build? All you need to do to be in with a chance of winning is answer the following question, and don't forget, you can also claim a second entry via Facebook. Thanks for taking part and good luck! The competition winner will be picked at random from all eligible entries that arrive by 22:00 London time on the closing date, April 15, 2019. The winners will be notified via email by April 22, 2019. The winner must claim their prize within 7 days of the promoter sending notification. If the prize is unclaimed after this time, HEXUS reserves the right to offer the unclaimed prize to a substitute winner selected in accordance with these rules. The prize is one Toshiba TR200 960GB SSD and one Toshiba RC100 120GB SSD. Thanks Hexus and Toshiba, Good luck all! Cheers Hexus, another quality competition! I won't win. But my 10,000 RPM 74GB Raptor is ageing a little.